1 Combine bread crumbs, Country Crock® Spread and Parmesan cheese in small bowl; set aside. 2 Combine Hellmann's® or Best Foods® Real Mayonnaise, cheddar cheese and milk in small microwave-safe bowl. Microwave at HIGH 1 minute, stirring once or until cheese is melted; stir until smooth. 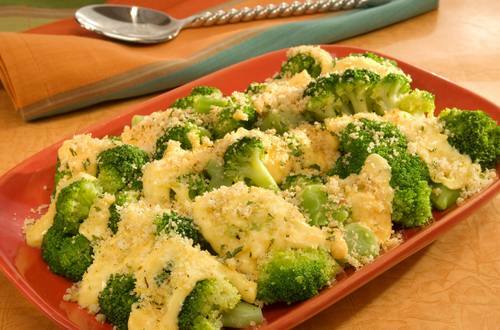 3 Spoon cheese sauce over hot Birds Eye® Broccoli Cuts, then sprinkle with bread crumb mixture.